Good luck to touch a cat thing! PREPARE YOUR PERSONA FOR 4 EXCITING NECO TOUCH STORY!!! Naoto is a bright youth who enjoys NECO TOUCH profusely! Smith is a USA boy who ascend 40 NECO to his head with one TOUCH! Aya is a smart woman who NECO TOUCH delicacy with spirit! Tanaka is a old man who does not believe a NECO TOUCH can being enjoy! 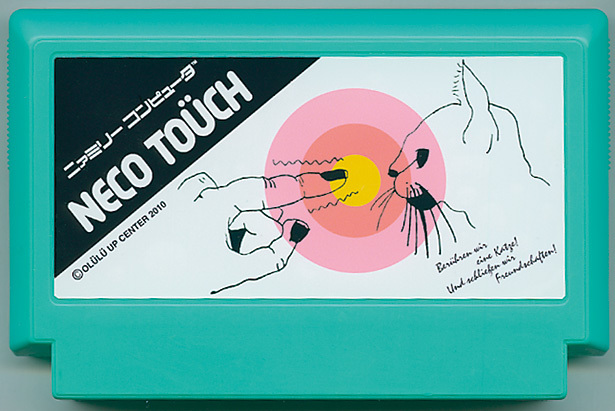 I can't read Japanese, but this game looks like it's about cat's controlling human hands with their minds. Awesome! It's about trying to touch a cat. I think mine's gonna be more of a retro platform dodge-em-up. Gonna work on it later this week. JR HILL! I'm totally thinking of doing this one. not actually fat, just posing. Most of this compo is turning into small hyper games like the once from Wario Ware, I LOVE THIS! I call it the KittenPunisher. My lisp code told me to leave. There is some German in that cover that says "Let's touch a cat! And make friends!" I'm utterly confused and intrigued. We could collab, I mostly just want to do NES-style success splash screens haha. I would love to collab with you, since you are awesome. BUT my idea for the game is completely different, heh. I changed my idea for the game completely too! Part 1: Hit the target (it gets harder and takes different forms as you go) or you WON'T TOUCH THE CAT BUT SOMETHING ELSE ENTIRELY!! Part 2: You are near the cat, but don't let your nerves get the best of you! You have to calm down, stop shaking, and hope to hit a part of the cat that is pleasing to your senses!! Part 3: CONGRATULACIONS YOU ARE NECO TOUCH!!! P.S. I'll do it in Flashpunk at double resolution probably. What does that Japanese in your mock-up say? I am seeing Persona 4 everywhere in this compo! Tanaka is an old man who [sells crazy products and has a rad theme song on the Tee Vee]! Naoto is a bright youth who [eez little detective person]! Smith is a USA boy who [okay this one doesn't really fit]! Aya is a [delicious Chinese diner about to get bum-raped by the Junes]! Also, this game looks great. Sounds familiar but I've never played it lol. Wow that's a big coincidence.